The new wing is designed to be more "child friendly"
A new wing for first-time criminals has opened at Ashfield young offenders' institute in South Gloucestershire. 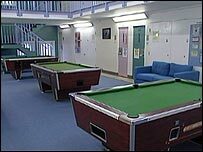 The unit, unveiled by Prisons Minister David Hanson on Thursday, has been designed to be more "child friendly" with pool tables and sofas. The wing is dedicated to cater for the increasing numbers of 15 and 16 year olds being sent to Ashfield. Its aim is to soften their first experience of custody and let them be taught in a safe, secure environment.